PT Sigma Cipta Caraka - PT SCC or known as "Telkomsigma" is a leading information technology (ICT) company in Indonesia. Telkomsigma running business in the field of integrated end to end ICT services. Its business include system integration, data center, cloud computing, and managed services. Telkomsigma was established in 1987, and within 29 years has established itself as the leading ICT company in Indonesia, with controls about 34% of managed services market in Indonesia. According to information found in Telkomsigma's website as cited by JobsCDC.com, Telkomsigma is a member of state-owned telecommunication giant PT Telekomunikasi Indonesia Tbk (Telkom Group). Telkomsigma is a directly-owned subsidiary company of PT Multimedia Nusantara (TelkomMetra), a strategic investment company in Indonesia fully-owned by Telkom Group. 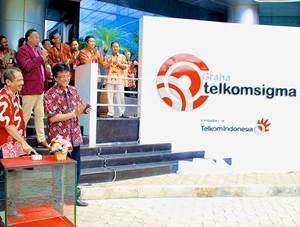 At present, Telkomsigma have a workforce of over 1,200 personnel spread in Jakarta, Serpong Tangerang, Sentul Bogor, Surabaya and Bali. Telkomsigma also supported 4 subsidiaries; PT Sigma Solusi Integrasi, PT Signet Pratama, PT Sigma Metrasys Solutions, and PT Graha Telkomsigma. Required language : Mandarin and English. Minimum 4 years of experience as Account Executive in IT company. Excellency in communication, commercial, and negotiation skills. Target oriented, hard worker, and able to work under pressure. JobsCDC.com now available on android device. Download now on Google Play here. Please be aware of recruitment fraud. The entire stage of this selection process is free of charge. Telkomsigma - Account Manager Resource Sector Private Telkom Group February 2019 will never ask for fees or upfront payments for any purposes during the recruitment process such as transportation and accommodation.